When I was a kid I had one of those awesome Spirograph sets – but mine was totally made of plastic. Still, plastic or not, it was loads of fun. 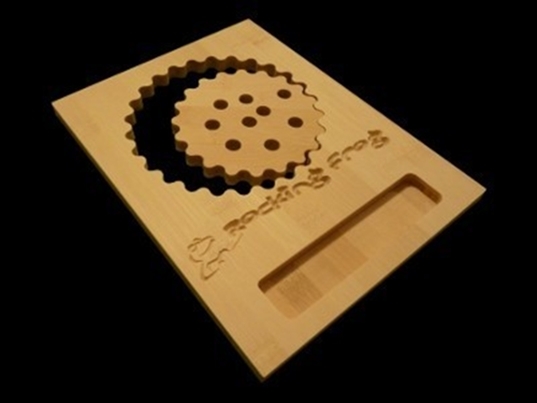 Today we’re luckier because kids have a cool Bamboo Spiral Toy available, courtesy of Rocking Frog. This sweet and crafty toy is the perfect way to expand your child’s creativity. The toy is versatile and easy for little hands to use, plus it’s small enough to tuck into a notebook with a few crayons, so you can take it anywhere. Plus, unlike the Spirographs of yesterday, this toy is made with zero plastic, and is instead crafted with smooth and natural bamboo. Your child can even decorate the spiral toy to make it his own – fun! When I was a kid I had one of those awesome Spirograph sets - but mine was totally made of plastic. Still, plastic or not, it was loads of fun. Today we're luckier because kids have a cool Bamboo Spiral Toy available, courtesy of Rocking Frog. This sweet and crafty toy is the perfect way to expand your child's creativity. The toy is versatile and easy for little hands to use, plus it's small enough to tuck into a notebook with a few crayons, so you can take it anywhere. Plus, unlike the Spirographs of yesterday, this toy is made with zero plastic, and is instead crafted with smooth and natural bamboo. Your child can even decorate the spiral toy to make it his own - fun!